To move substances against the membrane’s electrochemical gradient, the cell utilizes active transport, which requires energy from ATP. 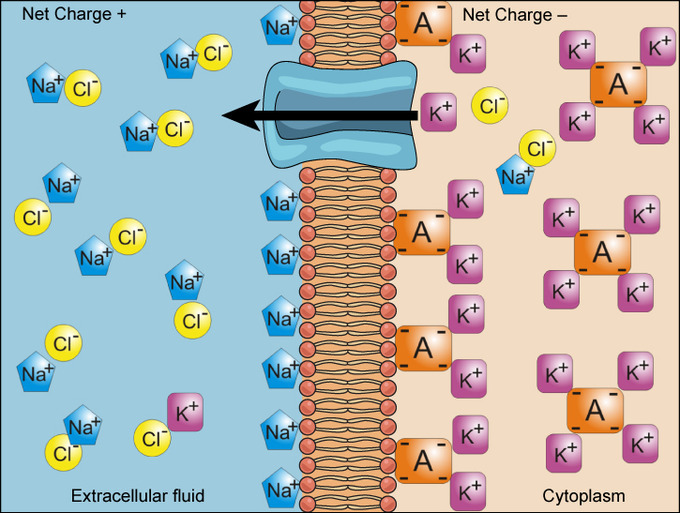 The electrical and concentration gradients of a membrane tend to drive sodium into and potassium out of the cell, and active transport works against these gradients. To move substances against a concentration or electrochemical gradient, the cell must utilize energy in the form of ATP during active transport. Primary active transport, which is directly dependent on ATP, moves ions across a membrane and creates a difference in charge across that membrane. Secondary active transport, created by primary active transport, is the transport of a solute in the direction of its electrochemical gradient and does not directly require ATP. Carrier proteins such as uniporters, symporters, and antiporters perform primary active transport and facilitate the movement of solutes across the cell’s membrane. electrochemical gradient: The difference in charge and chemical concentration across a membrane. Simple concentration gradients are differential concentrations of a substance across a space or a membrane, but in living systems, gradients are more complex. Because ions move into and out of cells and because cells contain proteins that do not move across the membrane and are mostly negatively charged, there is also an electrical gradient, a difference of charge, across the plasma membrane. The interior of living cells is electrically negative with respect to the extracellular fluid in which they are bathed. At the same time, cells have higher concentrations of potassium (K+) and lower concentrations of sodium (Na+) than does the extracellular fluid. In a living cell, the concentration gradient of Na+ tends to drive it into the cell, and the electrical gradient of Na+ (a positive ion) also tends to drive it inward to the negatively-charged interior. The situation is more complex, however, for other elements such as potassium. The electrical gradient of K+, a positive ion, also tends to drive it into the cell, but the concentration gradient of K+ tends to drive K+ out of the cell. The combined gradient of concentration and electrical charge that affects an ion is called its electrochemical gradient. Electrochemical Gradient: Electrochemical gradients arise from the combined effects of concentration gradients and electrical gradients. To move substances against a concentration or electrochemical gradient, the cell must use energy. This energy is harvested from adenosine triphosphate (ATP) generated through the cell’s metabolism. Active transport mechanisms, collectively called pumps, work against electrochemical gradients. Small substances constantly pass through plasma membranes. Active transport maintains concentrations of ions and other substances needed by living cells in the face of these passive movements. Much of a cell’s supply of metabolic energy may be spent maintaining these processes. For example, most of a red blood cell’s metabolic energy is used to maintain the imbalance between exterior and interior sodium and potassium levels required by the cell. Because active transport mechanisms depend on a cell’s metabolism for energy, they are sensitive to many metabolic poisons that interfere with the supply of ATP. Two mechanisms exist for the transport of small-molecular weight material and small molecules. Primary active transport moves ions across a membrane and creates a difference in charge across that membrane, which is directly dependent on ATP. Secondary active transport describes the movement of material that is due to the electrochemical gradient established by primary active transport that does not directly require ATP. 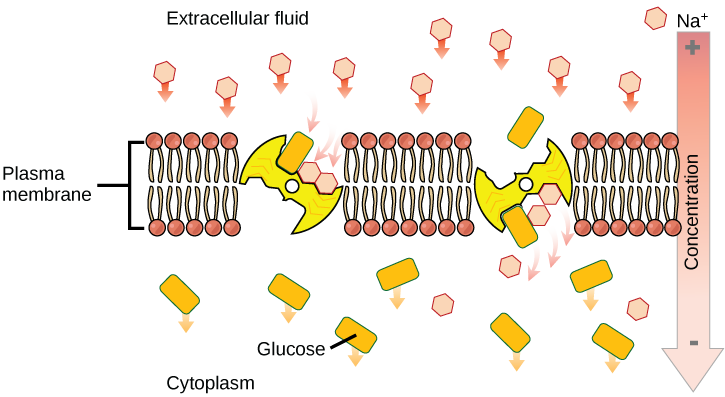 An important membrane adaption for active transport is the presence of specific carrier proteins or pumps to facilitate movement. There are three types of these proteins or transporters: uniporters, symporters, and antiporters. A uniporter carries one specific ion or molecule. A symporter carries two different ions or molecules, both in the same direction. An antiporter also carries two different ions or molecules, but in different directions. All of these transporters can also transport small, uncharged organic molecules like glucose. These three types of carrier proteins are also found in facilitated diffusion, but they do not require ATP to work in that process. Some examples of pumps for active transport are Na+-K+ ATPase, which carries sodium and potassium ions, and H+-K+ ATPase, which carries hydrogen and potassium ions. Both of these are antiporter carrier proteins. Two other carrier protein pumps are Ca2+ ATPase and H+ ATPase, which carry only calcium and only hydrogen ions, respectively. Uniporters, Symporters, and Antiporters: A uniporter carries one molecule or ion. A symporter carries two different molecules or ions, both in the same direction. An antiporter also carries two different molecules or ions, but in different directions. The sodium-potassium pump maintains the electrochemical gradient of living cells by moving sodium in and potassium out of the cell. The sodium-potassium pump moves K+ into the cell while moving Na+ at a ratio of three Na+ for every two K+ ions. When the sodium-potassium- ATPase enzyme points into the cell, it has a high affinity for sodium ions and binds three of them, hydrolyzing ATP and changing shape. As the enzyme changes shape, it reorients itself towards the outside of the cell, and the three sodium ions are released. The enzyme’s new shape allows two potassium to bind and the phosphate group to detach, and the carrier protein repositions itself towards the interior of the cell. The enzyme changes shape again, releasing the potassium ions into the cell. After potassium is released into the cell, the enzyme binds three sodium ions, which starts the process over again. electrogenic pump: An ion pump that generates a net charge flow as a result of its activity. Na+-K+ ATPase: An enzyme located in the plasma membrane of all animal cells that pumps sodium out of cells while pumping potassium into cells. The primary active transport that functions with the active transport of sodium and potassium allows secondary active transport to occur. The secondary transport method is still considered active because it depends on the use of energy as does primary transport. Active Transport of Sodium and Potassium: Primary active transport moves ions across a membrane, creating an electrochemical gradient (electrogenic transport). With the enzyme oriented towards the interior of the cell, the carrier has a high affinity for sodium ions. Three sodium ions bind to the protein. ATP is hydrolyzed by the protein carrier, and a low-energy phosphate group attaches to it. As a result, the carrier changes shape and re-orients itself towards the exterior of the membrane. The protein’s affinity for sodium decreases, and the three sodium ions leave the carrier. The shape change increases the carrier’s affinity for potassium ions, and two such ions attach to the protein. Subsequently, the low-energy phosphate group detaches from the carrier. With the phosphate group removed and potassium ions attached, the carrier protein repositions itself towards the interior of the cell. The carrier protein, in its new configuration, has a decreased affinity for potassium, and the two ions are released into the cytoplasm. The protein now has a higher affinity for sodium ions, and the process starts again. Several things have happened as a result of this process. At this point, there are more sodium ions outside of the cell than inside and more potassium ions inside than out. For every three ions of sodium that move out, two ions of potassium move in. This results in the interior being slightly more negative relative to the exterior. This difference in charge is important in creating the conditions necessary for the secondary process. 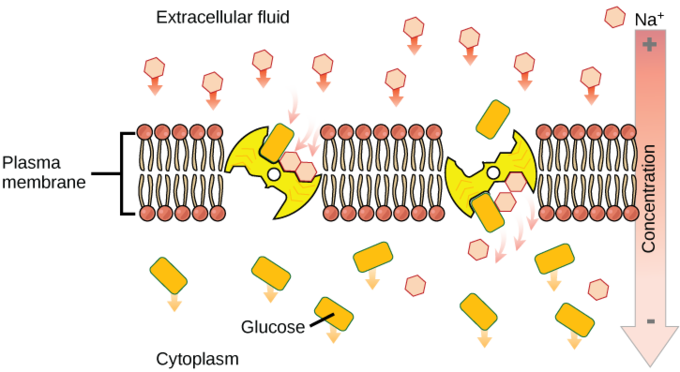 The sodium-potassium pump is, therefore, an electrogenic pump (a pump that creates a charge imbalance), creating an electrical imbalance across the membrane and contributing to the membrane potential. In secondary active transport, a molecule is moved down its electrochemical gradient as another is moved up its concentration gradient. While secondary active transport consumes ATP to generate the gradient down which a molecule is moved, the energy is not directly used to move the molecule across the membrane. Both antiporters and symporters are used in secondary active transport. Secondary active transport brings sodium ions into the cell, and as sodium ion concentrations build outside the plasma membrane, an electrochemical gradient is created. If a channel protein is open via primary active transport, the ions will be pulled through the membrane along with other substances that can attach themselves to the transport protein through the membrane. Secondary active transport is used to store high-energy hydrogen ions in the mitochondria of plant and animal cells for the production of ATP. The potential energy in the hydrogen ions is translated into kinetic energy as the ions surge through the channel protein ATP synthase, and that energy is used to convert ADP into ATP. secondary active transport: A method of transport in which the electrochemical potential difference created by pumping ions out of the cell is used to transport molecules across a membrane. Unlike in primary active transport, in secondary active transport, ATP is not directly coupled to the molecule of interest. Instead, another molecule is moved up its concentration gradient, which generates an electrochemical gradient. The molecule of interest is then transported down the electrochemical gradient. While this process still consumes ATP to generate that gradient, the energy is not directly used to move the molecule across the membrane, hence it is known as secondary active transport. Both antiporters and symporters are used in secondary active transport. Co-transporters can be classified as symporters and antiporters depending on whether the substances move in the same or opposite directions across the cell membrane. Secondary active transport brings sodium ions, and possibly other compounds, into the cell. As sodium ion concentrations build outside the plasma membrane because of the action of the primary active transport process, an electrochemical gradient is created. If a channel protein exists and is open, the sodium ions will be pulled through the membrane. This movement is used to transport other substances that can attach themselves to the transport protein through the membrane. Many amino acids, as well as glucose, enter a cell this way. This secondary process is also used to store high-energy hydrogen ions in the mitochondria of plant and animal cells for the production of ATP. The potential energy that accumulates in the stored hydrogen ions is translated into kinetic energy as the ions surge through the channel protein ATP synthase, and that energy is used to convert ADP into ATP. Secondary Active Transport: An electrochemical gradient, created by primary active transport, can move other substances against their concentration gradients, a process called co-transport or secondary active transport.